14th Floor, Eco Star, Vishweshwar Nagar, Off Aarey Road, Goregaon (E), Mumbai – 400063, Maharastra, India. 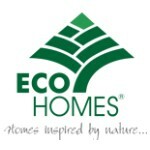 onstruction and real estate development, Ecohomes has already completed many a landmark residential & commercial project in Mumbai, covering a total area of one million sq. ft., with several more projects planned for the future. Currently, four projects are being developed in Mumbai, Surat and Karjat including 3 residential, 1 commercial hub and a 125 acre township in Kalyan. Our on-time completion record, prompt formation of societies and conveyances of the land to the society thereafter, is something most builders ignore and choose not to write about. At our large residential township project ECO CITY at Kalyan, we have over 100 acres of land bank, of which Phase 1 TATA AMANTRA is being jointly developed with TATA Housing Development Corporation Ltd. This is a matter of great pride for us.